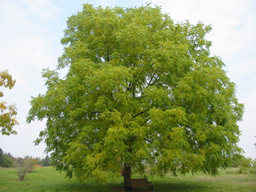 Your Black Walnut tree is a very special tree! Air quality, food and health; all are affected by this wonderful tree. Black walnut trees are very important to our food security. They provide edible nuts and support the life cycle of 130 different species of Lepidoptera (butterflies, moths), bees and beetles. According to Douglas W. Tallamy in his book, Bringing Home Nature, these pollinators contribute to more than half of our food production. It is true that some plants do not like to grow where the natural herbicide, juglone, secreted by the Black Walnut roots, is present in the soil. However most of these plants are non-native species. For more information on plants intolerant to juglone visit this website or call OMAFRA at 519-826-4047. Please consider planting your non-native plants in containers or raised beds with protective bottoms to mitigate the effects of the juglone rather than removing Black Walnut trees from your yard. This is what renowned Canadian botanist and scientist Diana Beresford-Kroeger has to say about this important species. Family members of the Walnut are the aristocrats of the forest. Every aspect of these trees is fascinating. North America has seen them come and now we are silent witnesses to their passing. The natural enemy of the Walnut is a deep and profound ignorance about these trees in our population. Walnuts set the ancient history of North America. They were the kingpin trees against famine, the scourge that has always haunted this continent. The trees were owned by the aboriginal peoples independently of the land on which they grew. Such advanced thinking was crucial for survival on a continent rife with abrupt changes in weather patterns. Walnuts produce nut meats. Pound for pound they are equal to steak in food value. The ratio of essential fats they carry is perfect for the brain development of the very young and old. These fats also protect the functioning heart. These high quality fats are essential for healthy cell functioning and are quite rare in the plant world. The nut meat of the Black Walnut is in itself unique. The chemistry of the protein is very stable. It does not change in taste when it has been processed unlike most other nuts. This puts the black walnut first and foremost in the world nut market. There simply are not enough of them grown, the demand is increasing without a corresponding increase in supply. Probably the most singular aspect of the Walnut family is their ability to manufacture a biochemical called ellagic acid. This chemical acts like a fisherman’s net and can snag the most toxic elements of fossil fuel combustion out of the air. They detoxify these killing compounds into something quite harmless. So they are important for the urban forest especially around day care centres and schools (and roads). In the end, it is something else that Walnuts do which should attract the attention of the world. The ellagic acid complex offers an ambient protection to breast cancer. It comes in an explosive form from epidermal microscopic hairs called trichoma. There could also be some other secretary tissue within the leaves’ mesophyl and on the surface of the nut husks. There is so very much more we need to know about this very important species. 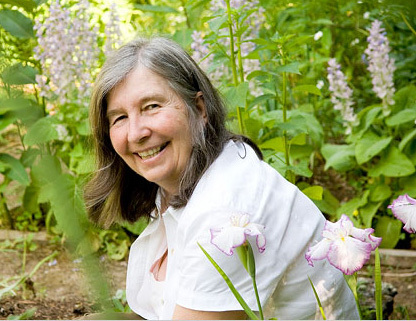 Diana Beresford-Kroeger is a renowned Canadian botanist and scientist with expertise in medical biochemistry, organic chemistry, and nuclear chemistry. Her book Arboretum America is available at Guelph Public Library or The Bookshelf.